The use of anticholinergics has been helpful to patents especially those who are suffering from obstructive airways condition. Like any medications, an increased amount of anticholinergics in the system can lead to a drug overdose [1, 2]. Anticholinergic drugs function by blocking the receptor binding of the neurotransmitter acetylcholine. This will lead in the inhibition of the impulses of the parasympathetic nervous system. This component of the nervous system controls the involuntary movement of muscles found in the lungs, digestive tract and urinary tract. 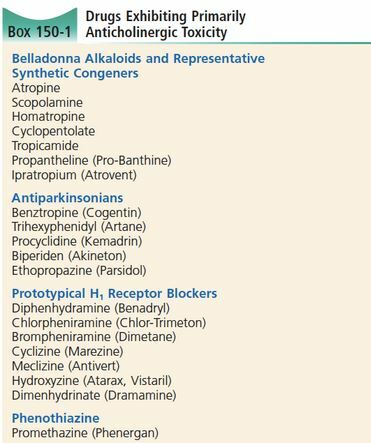 These medications are given to patients who are diagnosed with Parkinson’s disease, asthma, Chronic Obstructive Pulmonary Disease (COPD), gastrointestinal disorders and an overactive bladder. Examples of anticholinergic drug are atropine, ipratropium and oxybutynin and orphenadrine. Side effects of taking this medication include dryness of mouth, blurring of vision, urinary retention, decreased salivation, confusion and delirium [1, 2, 3, 4]. How much is Anticholinergic Toxicity? The toxic level of anticholinergic drugs differs for every drug type. Some of the toxic level of anticholinergics are as follows: atropine toxicity– 0.03-0.1mg/L, oxybutynin toxicity->0.2mg/L and orphenadrine toxicity-1.7mg/L. The toxic level of some anticholinergics is very close to the therapeutic level so it is possible to overdose in anticholinergics even if the person is only taking the recommended amount of the drug. Other factors that may increase the risk for an anticholinergic include the age, amount of acetylcholine in the system and taking multiple anticholinergic agents at once. Older people are at a higher risk for an overdose due to the decline in their brain’s performance. Someone who has a considerable lower amount of acetylcholine in the body can experience an overdose at a relatively lower dosage. Taking several types of anticholinergics simultaneously increases the effect of the drug [1, 2, 3, 4, 5]. What are Anticholinergic Toxicity symptoms? The symptoms experienced depends on the drug the person overdosed on and the amount of drug that was ingested. Physical symptoms that may be experienced include: tachycardia or increased heart rate, drying of skin, development of fever, elevation of blood pressure, dilation of pupils, involuntary jerking of muscles, retention of urine and reduced bowel sounds. Neurological manifestations include: disorientation, dysregulation of emotions, amnesia or loss of memory, tremors and poor judgment. Similar to phenobarbital overdose, the patient may be confused or have slurred speech [1, 2, 3, 4]. What is Anticholinergic Toxicity management? An individual who has overdosed on anticholinergics should be brought to a hospital with advanced cardiac life support facilities. When they arrive in the hospital, an assessment of their airway, breathing and circulation will be performed. An emergency intubation may be performed if there is any indication of respiratory depression. They will need to be connected to an electrocardiogram (ECG) due to the tachycardia which may manifest. An intravenous access should be established for the administration of medications. Once the patient is stabilized, decontamination of the gastrointestinal system will be performed after. A single dose of activated charcoal may be given to patients. This may be done even if more than an hour after the ingestion due to the decreased peristalsis secondary to the overdose. The antidote that is used for anticholinergic toxicity is Physostigmine salicylate. Other symptoms that have manifested should be managed through the use of other medications. Although most patients recover without using the antidote, this drug should be given if there a compromise in the hemodynamic stability of the patient or if the seizures are not resolved even through the use of other medications [1, 2, 3, 4]. How to prevent Anticholinergic Toxicity? The best way to prevent the occurrence of anticholinergic toxicity is to take the medications based on the orders of the physician. Any side effects felt should be referred immediately to prevent the development of complications. Medication bottles should be labeled properly and kept in places that are out of children’s reach in order to prevent accidental ingestion [1, 2, 3, 4]. An overdose in anticholinergics can be dangerous. If you have more information about this overdose condition, share it to other by posting in the comment section below. Schulz, M., Iwersen-Bergmann, S., Andresen, H., & Schmoldt, A. (2012). Therapeutic and toxic blood concentrations of nearly 1,000 drugs and other xenobiotics. Critical Care, 16-19.